I discovered Grant's Advent Calendar in 2006 through Mur Lafferty's podcast and looked forward to it every year. In 2010, we bought an Advent Calendar for our son, Wheeler, and he started opening doors. Grant is a talented puppeteer, entertainer and creator. He genuinely loves kids and fun and is incredibly generous and gracious -- he watches each of Wheeler's videos, comments on them, invites him to group calendar openings. This podcast is not only fun, it is an integral and traditional part of our family Christmas and inspired an amazing tradition of our own. Thank you, Grant. Whoohoo! It's that time again! I look forward to Grant's Advent Calendar every year! It's better than having my own Advent Calendar at home-- my boys can't eat all the candies and play with all the surprises ahead of time! Thanks Grant!! Once again Grant, you rock! Introduced it to Zoe! She liked it! I watch Grant open his advent box with fun anticipation! I have been following him since the begining and I will continue to follow. Now its a tradition for me and my kiddos! Do yourself a favor and subscribe! You won't regret it. I'm so excited! As soon as I saw this year's promo was up I posted it on Facebook and Twitter. Trying my best to share the fun. Thank you so much for all the time and hard work you put into this every year. Only 2 more days to wait! Woohoo! That was great! Loved seeing you and your Dad together for Day 23. The best part of my day! Since my birthday is only a few days before, the countdown to christmas is also like a countdown to my birthday. The past few seasons have been more about mundane stuff than about the christmas season. Grant's daily few minutes of advent goodness has made up for the lack of holiday spirit I've been getting elsewhere. Hate to see the 25th get here, but I'm already looking forward to next year! Thanks for the time and dedication Grant! Updating because we still love it!! I'm Barb and I love Grant's Advent Calendar Video Podcast!!! Have been watching it for several years now and it even inspired my family to get advent calendars for my two boys! They love it, I love it, my Mom (who introduced me to it) loves it, and my sister-in-law loves it! LOVE! We've been watching since 2009 - Loved it then, loving it still even when the kids are older. Great for kids and adults! Grant’s Advent Calendar is one of my favorite holiday traditions. Been watching them since I was a little tike in the 1950’s. Thanks to time travel he looks as young as he was back then. Thank you science. "Grant is very funny. He is so fun to watch. Everyday his hairstyle or his outfit is good. I like seeing what's in the calendar every day. He is so cool. I like watching with my dad." Dictated by Phoebe and transcribed by her dad. We've been watching this podcast for a number of years. It's become part of our holiday tradition. Lots of fun and always a delight. Keep up the great work, Grant. This podcast is such a fun way to spend Advent. We look forward to it each year wondering what kinds of things Grant will find behind the doors each year. Keep up the great work Grant! We appreciate it. My kids and I enjoy the podcast every year. My daughter couldn't wait to show her grandparents - she kept saying "watch this, this one's really funny" for each episode! 2012 has some of the best episodes we've seen. Many thanks to the Advent Calendar Commission for entertaining gifts! The only thing I would like to see (well, hear) is more of Grant's own music. Keep up the great work, Grant! I'm a bit behind in viewing the 2012 season of the show, but I know from past years that Grant finds new and creative entertaining ways to opn little doors to see what goodies have been left for him. If you've never seen the show I highly suggest watching (even if you're reading this after Christmas). I'm sure once you do you'll love it as well and you'll want to watch every year too. Remember, there's no tradition like a new tradition. Grant's Advent Calendar is great fun for kids, but you don't have to be a kid to enjoy Grant's ever creative ways of opening the calendar. It gives me a reason to smile after a long day at the cubicle. The cats and I love it. Hey, Grant, where can I get one those eyeballs with wheels to scare my cats with? Thanks to my sister, algonacchick, for introducing me to the experience that is the Advent Calendar! I've been a fan of Grant's Advent Calendar since 2005, and I've loved every. Single. Episode. It just isn't Christmas without this wonderfully silly podcast. If you don't love this podcast, you probably hate Christmas. And joy. Grant and his friends have become a Christmas tradition at our house. We love his creativity and humor. I am always pleased to share the fun and magic Grant's Advent Calendar adds to the holidays with my kindergarten class. His humor is perfect for all ages [even the teacher! :-) ] We truly appreciate all his talents! I am from the podcast dancing with elephants, and I love this podcast! It's short, simple, and hilarious! This is definitely one of my favorite podcasts! I've been watching Grant open the advent for several years now. It just wouldn't feel like December without watching his creative podcasts daily. Greatest holiday podcast tradition. Longest running holiday podcast on the Internet! Family friendly and funny. Join the fun and tell a friend right now! Our family looks forward to watching this video podcast every Christmas season. It's short, sweet & so creative! We've been watching since 2007. I love how creative Grant is. Never are two days the same. My family really enjoys finding out what Grant will find in his advent calendar each day. Now one of these years, I'll have to get a nice advent calendar for us. Thanks for giving us an advent calendar to enjoy, Grant and Grant's mom!! I look forward to Grant's Advent Calendar every year - a quick silly burst of fun every day through Christmas. In the young medium of podcasting, it's already become a holiday tradition. This has become a great holiday tradition. If you're new, hey, traditions have to start somewhere, right? Kudos to Grant for making something so small seem so special. We always look forward to another 25 creative ways to open those little doors and find out what's inside. Keep up the great work! Exactly what podcasting was made for! We gather each day to catch Grant and his Advent Calendar during the season and have done the same for the last 5 years at least, I would guess. Check it out with your friends and family today! What a great way to share the holidays! This vidoe podcast is sure to become a favorite family tradition - just watch it once and you (and your kids) will be hooked! Grant shares the opening of his personal advent calendar to count down the days to Christmas. The contents are always itneresting and fun as is the variety of ways Grant opens the calendar. There is music, drama, and guest "openers" as well as a viewer contest each year. This will be my sixth year of watching the advent calendar podcast and I have shared it with many of my friends. Hopefully, you will discover it as well! I love this podcast. I look forward to the highly creative ways Grant opens the doors of the calendar. One year Grant became ill and eventually had a hospital ID bracelet on one day and the next he was a zombie! It was sooo funny and shows his ability to improvise. This podcast helps me get in the Christmas mood. Grant's been a driving force of the The Radio Adventures of Doctor Floyd podcasts, and he's been creating skits showing his daily advent door opening for the last 8 years (10 years counting his pre-video picture postings!) Always fun to see what clever bits he can think of each day as he creates a new 2-3 minute video for the holiday season… Thanks Grant!!! This is an awesome video podcast. It makes opening up an Advent calendar a humorous treat for young and old viewers alike. Great family entertainment, it really helps me get into the holiday mood! The podcast has been on going for nearly eight years now and with each year, Grant has managed to entertain and amuse in ways that make you want to share each and every video. This will give you a reason to get up all of December ! Grant's advent calander is adictive and fun for the whole family I watched it with my wife at first and now I get to watch it with my daughter! This is truely family fun at it's greatist! fun, well thought out and by the time grant is done you just might buy an advent calander for the next year !! Grant is one-of-a-kind. Talented, humorous, full of energy, and extremely creative! It's amazing to see how Grant transforms a daily act into something unique and entertaining Keep up the great work! :D Year after year, Grant delivers something entertaining for the whole family! Update: My third year watching, and it's still fresh and fun to watch. This is our 3rd year watching Grant open his calendar. My 5 & 7 year old boys can't wait to see the previous day's podcast before school each morning in December. Grant has even inspired me to make a calendar for them. Thanks for the Holiday fun, Grant!!! You've become a tradition in our home! 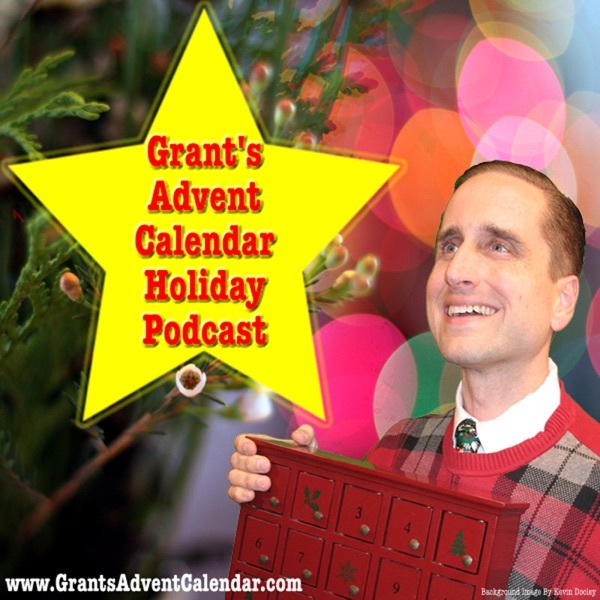 I look forward to Grant's Advent Calendar podcast every year. Our family of three gathers around the computer to watch it. It's always entertaining, and we love being a part of it. I look forward to Grant's Advent Calendar every year. It's creative, funny and family-friendly. How he can keep the process of opening one teeny door every day so fresh is a wonder. Each podcast is an advent-day treasure. Thanks! Grant's Advent Calendar Podcast is silly fun and I look forward to sharing it with my son once he's old enough to comprehend such things. I wait all year for this show to come back. Grant's creativity is entertaining and keeps the holidays fun! We watch this every year. A new tradition! We follow this every year. It is one of our new family traditions, which inspired us to get our own advent calendar. It is good for kids and adults, alike, much like the other wonderful podcasts Grant has put out there over the years. You should definitely check it out. I doubt you have any chance at disappointment with this one! This is the best video podcast in a malenia!! This is one of the things I look forward to every December!!! Each year as Advent nears, while our friends and neighbors look forward to caroling, shopping and stocking stuffing, our family looks forward to seeing what will appear next in Grant's Advent Calendar. Grant's family friendly video podcast has been entertaining our family since 2005. Grant's presentation is always great, and to my surprise the podcast gets better every year! Keep up the great work Grant! Oh, and good luck with Fredericks.